Goose fighting competitions become a popular diversion in rural Russia. Nikolai Kalinichev, 62, is chairman of the goose breeders. He lives in the village of Malyavino in the Yaroslavl Region. There is a tractor parked under the window of his house. The chairman of the goose breeders has been breeding geese for as long as he can remember. Goose breeders are constantly rattling off bits of information about the theory of the purity of blood as it relates to their goslings. To some extent everything that happens in this community resembles Nazism. On a recent weekday, Kalinichev climbed the stairs to the second floor of the local community center. It is a week before the fights, and all the goose breeders must agree on a specific date. All the goose breeders are about the same age with the exception of Anton, who is 17. "In short, I will tell all goose breeders and enthusiasts," Kalinichev said, opening the meeting, "we have completed a tour of Russia. 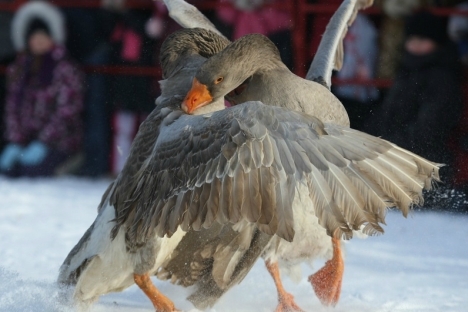 There were goose fights in Podolsk, Moscow and Rylsk. We brought along the trophy. The fight lasted 22 minutes. And the opponent fled from the wing!" In order to understand this statement, it is necessary to know the rules of goose fighting. First, there is the “taking.” A classic fight looks like this: two geese bite each other in the wings. When this happens, according to the goose breeders, the birds experience incredible pain. At some point, one loses patience and takes the other by the head, and this is called the "taking." Being taken by the head should be avoided because a goose can lose its eyes. Three takings during the course of a fight and the opponent is considered defeated. A faster way to lose is to have your goose’s leg bitten. If a goose catches the other goose’s leg, he immediately loses. "The goose's leg, just like with a horse, is a sore spot" said a man named Vyacheslav, the referee of the Pavlovo fights. "People decided on this rule about 300-400 years ago; we didn't come up with it. It has always been this way. The first taking by the leg is immediately considered a loss." "To flee from the wing" means that the opponent cannot stand the pain in his wing and flees; it is a clear victory. This is valued more than anything. No one specially trains a goose. According to goose breeders, "a goose is either born to be a fighter, or he is fit for soup." The most difficult part of organizing the fights is determining how to match up the fighters. They are divided into age groups. First are the two-year-old geese. This age is considered transitional; then come the three-year-olds, and after them the four-year-olds. Geese that are more than five years old fight in the most prestigious category: the old ones. In each category, goose breeders are divided into pairs, and at this point the question of who fights with whom must be decided. Goose fights are held in the spring, during mating season. When the goose breeders say that fights are a natural process, they are almost right. "They are fighting, after all, for their loved one" Kalinichev said. But from the point of view of nature it does not matter how a gander secures victory when fighting for a female: by taking the wing, leg or head. All means are justified when it comes to love. By the house of the chairman of the goose breeders, there is a large enclosure with geese. There are several more enclosures nearby. The birds live in families, each in their own quarters. Nearby there is a gas burner so that the carcasses can be more easily incinerated. One of the geese avoids this fate. The fighter at the same time will try to ensure a long and happy life for his loved one, because without her he will not fight. "This is Demon! This goose is a leader," Kalinichev said, pointing to a goose. "This one will fight for its female down to the last." Vyacheslav Borisovich, the referee of the geese fights, 60, has been refereeing fights for more than 20 years. Goose breeders live quite well. All have houses and farms. It is difficult to determine what their income is in terms of city living, but at least no one looks poor. "Right now we do not wager bets on fights. There was a time when proposals were put forward to fight for money," Vyacheslav said. "I am against money. When money gets involved, then you immediately see doping.” Yes, there is doping for geese. “Earlier there were fights for drinks,” Vyacheslav continued. “The loser would provide the drinks and together with the winner would celebrate the end of the fight. That was a hunt for love. And now people from beyond the Volga propose the following to us: Each party fights against each other, and the loser gives up the gander and all his geese. But all this is pure hostility!" From conversations with the goose breeders it became obvious that they do not make money on the geese. On one hand, goose is the most profitable meat for a family. It is not necessary to feed geese in the summer; they only need to be driven to pasture. But the problem is that geese are cheap only until October. After that time farmers have to invest in feed. Within the goose breeding community, there is a code of mutual assistance; goose breeders do not sell geese to each other: they only present them as gifts, and later they collect the goslings. Perhaps they are not rich, but goose breeders are not threatened by starvation. The article is abridged and first published in the Russky Reporter weekly magazine.